Download our FREE Value Comparison Sheet! Gartner ranks Skype for Business as a Top Quadrant leader for Unified Communications, and KiZAN can deliver this robust platform with extensive cost savings over the competition. As illustrated in the accompanying tables, even with steep discounts, Cisco’s complex mix of back-end requirements and licensing more than double the cost of deployment to achieve a comparable result. Complete the form to read the full report. 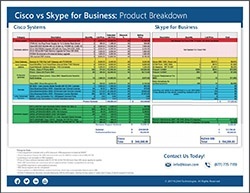 Download our FREE Comparison Sheet!